* End-time of the lunch meetings can be extend until 14:15 (45 min before the start of PM oral-sessions). ** End-time of the evening meetings at the site B should be shorter owing to closing-time of the building. The workshop on volcanic lakes is composed of two sections. The first section is held near Aso volcano on 25th to 28th July 2013, including two days for conference in which various studies on volcanic lake are presented. Field trips to crater lakes on Aso and Kirishima volcanoes are also included in the first section. We move to Hokkaido Island after the first section. 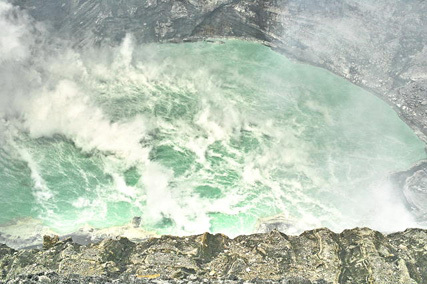 In the second section, we visit the crater lake at Noboribetsu-spa and geothermal area of Usu volcano. The airfare from Kyushu to Hokkaido is not included in the above fee. Air tickets will be arranged after the participants are determined. The estimated airfare from Fukuoka Airport to Chitose Airport is JPY 25,400. The finishing point of the second-half workshop is Chitose Airport. The fee for the return trip is not included in the above fee. Air tickets to Haneda, Narita, and Kansai Airports will be arranged if you would like. Those who wish to attend the related meeting should register online. A two-day workshop focusing on all aspects of volcano acoustics will be held in conjunction with the 2013 IAVCEI Scientific Assembly. 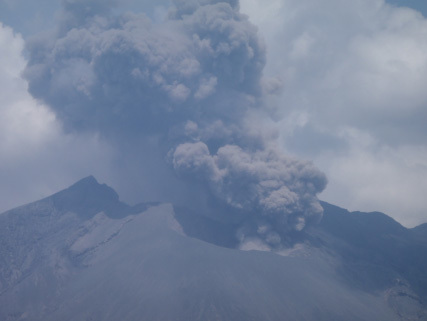 The workshop will take place on the active Sakurajima Volcano and will provide unique field opportunities to service infrasound sensors on an erupting volcano and then analyze recorded data with a group of experts. Discussion of current topics in volcano acoustics and outreach to local communities will also occur. Students are particularly encouraged to attend. Registration information, costs, and a workshop website will be available soon. Partial financial support provided the Geophysical Institute of the University of Alaska Fairbanks and Boise State University. Price includes two lunches, meeting space, and transportation. Single night accommodation is free for first 20 students to register and JPY 5,000 (~$60 USD) per night for other participants. Accommodation cost includes dinner and breakfast, and will be paid at the accommodation site. Reimbursement for withdrawal/cancellation must be arranged with the workshop's organizers. We are planning a parallel workshop to take place before the meeting, on Friday 19 July 2013 in Kagoshima. This workshop is not on the official workshop list, but it complements a session on “Stress, strain and mass changes at active volcanoes”. The workshop will be focused on teaching new methods for calculating parameters that are useful in volcano monitoring. The workshops will consist of 1/2 to 1-day sessions on topics of interest. Sample data sets will be provided for each of the methods and will be discussed at the workshop. 2. Methodology and programs for using background seismic noise to monitor changes in surface wave velocity with time. The package called MSNoise (Monitoring using Seismic Noise) will be used and is written in Python (no Matlab needed). Presenters Florent Brenguier and Thomas Lecocq, from the Royal Observatory of Belgium will be presenting it. 5. Seismic amplitude ratio analysis. Presenter Benoit Taisne. The workshop is free, but you need to sign up by May 1 with an indication of which sessions you are most interested in attending. Description: This is an inter-disciplinary workshop for funded collaborators from institutions participating in the PLUTONS project to compare results. Participation is by invitation only (because the facility only holds 20 people). Pingu: plots standard major element and trace elements diagrams. BET_VH: graphically supported computation of long-term probabilities of hazardous volcanic phenomena through a Bayesian Event Tree model. Windre: statistical analysis of wind direction and speed near any of 536 historically active volcanoes. TEPHRA2: calculates the mass loading of tephra on the ground. Includes forward, educational, and probabilistic versions. Titan2D: models geophysical mass flows (volcanic flows, avalanches, landslides etc.) over natural terrain . Each of these tools is installed and available for use on VHub.org. Come to the workshop for explanations, help, and hands-on exercises with these and other VHub.org tools. Get your questions answered and find out where to go for more detailed information about any particular model. Find out how to become a tool developer and share the models that you have designed for your own research with the greater volcanological community. To register, please email Jorge V. Bajo Sanchez at jvbajo@buffalo.edu with your full name and affiliation. If you would like the organizers to arrange a Japanese-style box lunch for you to purchase on site, please indicate your interest in the registration email. The anticipated cost of these lunches is 1200 yen to be paid on-site (outside food is not allowed to bring at the meeting place, except the lunch box). Please cc Leah Courtland at courtland@mail.usf.edu when registering. Registration is free but must be completed by May 1st. Cancellations must be made no later than May 15th. Prediction of the impacts of volcanic mass flows (lava flows, pyroclastic density currents, debris avalanches and debris flows) is required for hazard and risk assessment, and for design of risk mitigation measures. Numerical computer-based models now exist, capable of approximating the motion of a given volume of volcanic material from its source to the deposition area. As the technology begins to mature, it is useful to compare the various models each other. A benchmark is a comparison of models aimed at simulating the same physical process upon common initial and boundary conditions and outputs, but using different physical formulations, mathematical approaches and numerical techniques. Following the approach of inter-comparison projects for volcanic ash dispersal and atmospheric models, and the 2007 Hong Kong Landslide Runout Analysis Benchmarking Exercise, we propose a one-day workshop that will set up the basis for a future general benchmarking exercise on volcanic mass flow models. The workshop program will include two separate sessions focusing on pyroclastic density currents (morning) and lava flows (afternoon). Each session will consist of an introductory lecture, an open discussion to establish the set of benchmarks able to cope with the challenges of modeling volcanic mass flows and, if possible, selected presentations of preliminary results from the participants of the benchmarking exercise. To register, please email Sylvain Charbonnier at sylvain@usf.edu, with your full name and affiliation. If you would like the organizers to arrange a Japanese-style box lunch for you to purchase on site, please indicate your interest in the registration email. The anticipated cost of these lunches is 1200 yen to be paid on-site (outside food is not allowed to bring at the meeting place, except the lunch box). Please cc Benoit Cordonnier at benoit. cordonnier@erdw.ethz.ch when registering. Registration is free but must be completed by May 1st. Accurate prediction of volcanic systems requires understanding how it flows. Rheology establishes the constitutive law later used in numerical modeling and is fundamental for research or risk assessment. It can be only achieved by pushing further the rheology of magmas. It recently experienced serious turnovers. Rheology of two phase magmas (i.e. Melt + bubbles or Melt + crystals) reached a degree of global comprehension which allows tackling the last major step, three phase magmas rheology. However, beyond the positive progress new questions have raised and some questions remain to be solved. Among these questions are the rheology at low strain-rate, the impact and limits of crystal rigidity, strain/stress localization, stability of bubbles or the real sources of Non-Newtonian behavior. With the present working-group we wish to namely, 1- reference and archive previous works on magma rheology into an open database operating under the best of nowadays possibilities in terms of analysis and communication, 2- gather each year all specialists of the field to discuss domains of investigation and define the hard-lines which require strong focus, 3- Increase collaboration and efficiency of teams sharing similar interests. Registration is free but must be completed by May 1st. To register, please e-mail Benoit Cordonnier (benoit.cordonnier@erdw.ethz.ch), Antonio Costa (antonio.costa@bo.ingv.it) or Hidemi Ishibashi (shishib@ipc.shizuoka.ac.jp ) (with your full name and affiliation). A half-day workshop will focus on fundamental processes and social impacts of tephra falls and volcanic gas dispersions. These phenomena are often primary concerns to local populations living around active volcanoes because of their high dispersal capability. One million people living in Kagoshima city and the surrounding area, at which the workshop will be held, also have experienced numerous ashfall events from Sakurajima volcanoes in the last half century. We will share the lessons learned from such recent volcanic eruptions in Japan and some other countries and discuss the effective future management on similar hazards. To register, please email Yasuhiro ISHIMINE at ishimine@niph.go.jp with your full name and affiliation. Registration is free but must be completed by July 1st. Cancellations must be made no later than July 15th. Are you an early-career scientist? Is this your first IAVCEI meeting? network. Find out more about what IAVCEI does and what it can do for you. After the event we will be heading out for dinner and drinks.